love, elizabethany: nifty: i got moo cards from klout! nifty: i got moo cards from klout! People who tell me social media is silly still make me laugh, really hard, very loud. If you haven't already figured it out, it's pretty easy to make extra money, get free stuff, get jobs, etc. If you're on Klout, you can get even more free things with all of their perks! 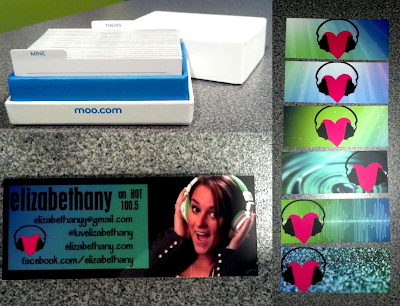 They're offering 100 free "moo cards," which are basically smaller business cards that are 100% customizable by you. You can have 100 different backs if you want, and whatever you want as the common front. If you pay attention to them, you'll see my new logo that I'm gonna start using more, and also "elizabethany.com" as my website. Yes, this here blog will be changing to that shortly thanks to issues that I'll explain later. I plan on doing a lot more street marketing/interviews for my show, and these are perfect for that. Everyone I interview, meet, or talk to, I can just pass one of these to them and BAM! Hopefully I score me a new follower! Overall, they're great quality. Some of them have some printing imperfections, but only something that my perfectionist self would notice. I think they're something people will enjoy and keep! Holler if you got some too! I wanna see your design! DanChiz's have a QR code which I totally wish I would have added!